Are you ready to Cosplay Rumble? Get ready to cosplay rumble! The event will be on November 12-13. It’s a Saturday and a Sunday so you do not have any excuse not to join and have tons of fun. Remember it’s all about enjoying what you love. For more updates and event information you can check out their official event page. 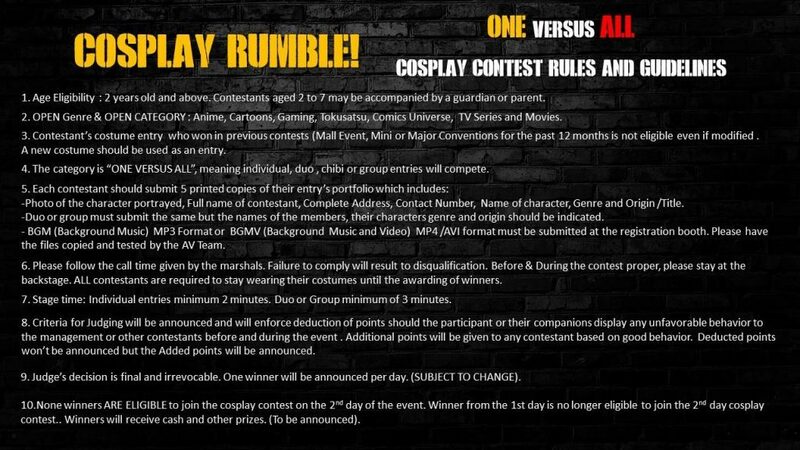 If you are thinking that their cosplay competition will again be a hand-over to previous event winners then think again. Cosplay Rumble bars previous costume winners from all events both major and minor. This means that those who want to join and have won previously need to enter a brand new costume. Take note that modification does not count as a brand new costume as well. 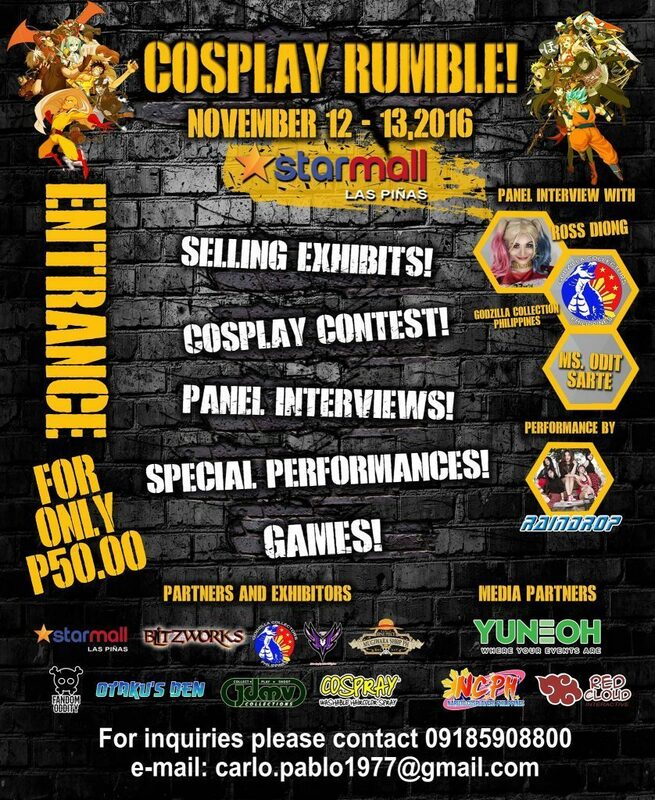 It will also be a 2-day cosplay competition with separate contests on both days. Non-winners can join the 2nd day as well. It will be a rumble, meaning one versus all so, you can join as an individual, duo or as a team. Check out the full mechanics in the image below. Check out the latest anime and geek items for sale at the event. Various exhibitors like Cospray, Otaku’s Den, Fanshoppe, Mugiwara Shoppe, Fandom Oddity, Saiki’s Toyland, Lucky Gracious, Cosplay and Casual Closet and more are ready to fulfill your needs. A brand new enclosed venue will be the events site. All you have to do is pay Fifty Pesos as an admission fee and you’re done. Why the low entrance fee? Well, the organizer just wants to ask for your support so that there will be more events in the south. This entry was posted in Events, Media Partnership and tagged cosplay competition, cosplay rumble. Bookmark the permalink.